One of Lombok’s most important and popular festivals is Bau Nyale, meaning “to catch the sea worms” in local Sasak language., the Nyale is sea worms in a variety of color are brown or pale cream to red and green. Bau Nyale, or the Nyale Festival, takes place every year in the tenth month of the Sasak calendar at a time close to the full moon, it’s celebrated in February around 14th and 15th in the south coast beaches of Lombok. The most popular site for celebrating Bau Nyale is at beautiful Seger Beach near Kuta; an area called Putri Nyale (Princess Nyale) by the people of Lombok. One week before this celebration, the accommodations in Kuta are fully booked with local and overseas visitors who want to see the Festival directly. The festival starts with many attractions such; Presean (people fighting), Adu Pantun a form of traditional poetry, where young people tease and with each other, competing to form verses in a ritual style. The highlight of the festival is the drama which story a legend of Putri (Princess) Mandalika, who was the princess of a large kingdom called “Yellow Flower”. According to local myth, this kingdom was famous throughout the land and Princess Mandalika was very beautiful, as well as being kind and well-loved by the people of her kingdom. So many men wanted to marry her that it began to cause trouble between the different kingdoms and the Princess became unable to choose between them without her decision causing further trouble. Finally the princess’ father, King Kuripan, gathered all the rivals together and instructed Princess Mandalika to choose her husband before sunrise the next morning. Fearful of causing a war, instead of choosing one of them, Princess Mandalika declared that, even if she loved one of the suitors, she loved her parents, her kingdom and the people of her kingdom too much to cause a war. Saying that, rather than choose one, she would give herself to everyone, she threw herself into Seger Beach, declaring that she would return each year as a sign that she would never leave her people. Everyone searched the surrounding sea for the princess, but instead of the princes they just found colourful sea-worms, called Nyale. According to a local priest, or Dukun, the princess’s body had been transformed into these sea worms, and thus they became a traditional symbol for the Sasak people. 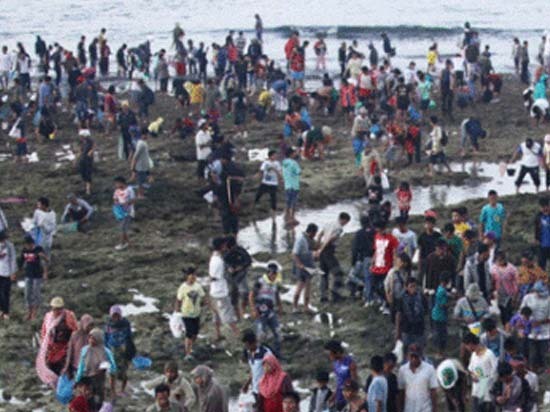 The highlight of the ceremony occurs when the local priest or Dukun go to the sea to observe the spawning Nyale and predict the future rice harvest, based on the number of sea worms. A good catch is a sign that this year’s rice harvest will also be good. Nyale are traditionally associated with fertility, and as part of a ritualized ceremony, the sea worms are ground up and placed in irrigation channels around fields to help ensure a good harvest. People are collected the worms to eat them for a special annual feast. Nyale are eaten sometimes raw when they are caught, or steamed, fried, or made into Pepes Nyale. In this popular local specialty, the Nyale are mixed with coconut and spices, then wrapped in a banana leaf and roasted over the fire. The sea worm taste is delicious and rich in protein.